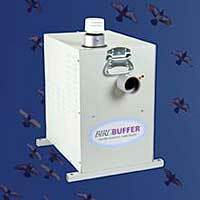 The Bird Buffer, offered by Nixalite, is a programmable, electronic aerosol generator that repels flying birds - indoors and outdoors- by producing a nearly invisible repellent haze. It is designed so that birds that fly through the haze associate the location with the repellent's effect and leave the area. The machine converts liquid Fog Force, a food-grade grape flavoring, into tiny particles and then blows them into the air at 90 mph to create an invisible haze that stays suspended for about six hours.